One of the dishes developed by the Chefs from Meallmore. If a more calorie dense dish is required swap the light coconut milk for a full fat Option. Place the coconut milk and double cream in a pan and bring to the boil stirring continuously. Remove from the heat and whisk in the CARTE D'OR Panna Cotta. Allow to cool slightly, then pour into dariole moulds. Cover and place in the fridge to chill and set for 3 hours. Dice the pineapple, finely chop the chillies and shred the fresh mint, place in a bowl and mix well, cover and refrigerate until required. Unmould the panna cottas by dipping the base of the moulds in hot water then turn out onto the serving plate. Arrange the pineapple salsa around the panna cotta. Crumb the ginger biscuits and place around the plate. 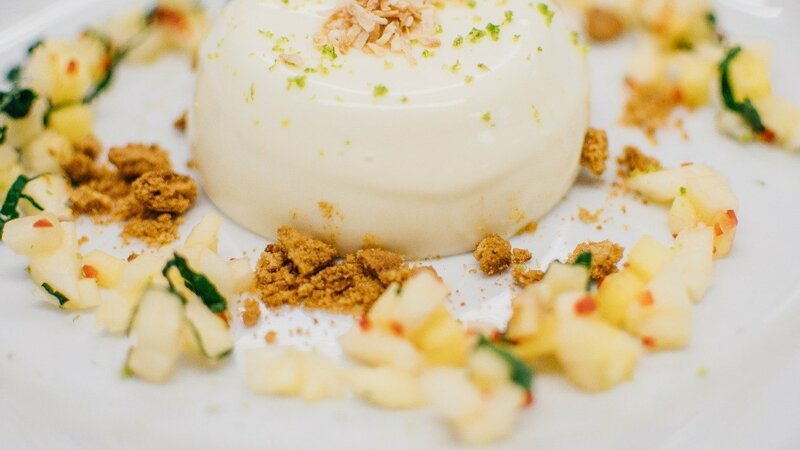 Finish the dish by sprinkling toasted desiccated coconut on the top of the panna cottas and then finely grating the zest of a lime.